An event which has proved a big hit in Medbourne over the last two years is rumbling on to Market Harborough this weekend and a world record attempt will be in the sights. The Truck-Pull Challenge UK hits the streets of Harborough this Sunday, from 10.30am. 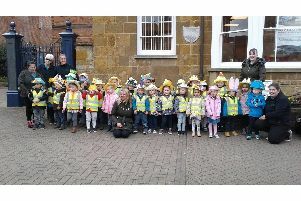 The event has attracted a crowd of several thousand in Medbourne in 2013 and 2014 but organiser Gary Gardner has moved the event to the Harborough district’s biggest town this time around in a bid to attract even more attention. The 8.6-tonne Eddie Stobart trucks, will be pulled by eight teams in turn as they vie to record the quickest time. The route, which is just over a mile long, will start on the outskirts of town, near the Tesco Express in Rockingham Road, and trundle on to the finishing line at the bottom of St Mary’s Road between the two jewellery shops. A rolling road block and road closure will be in place in Rockingham Road and St Mary’s Road from about 10.30am until 4.30pm so motorists are advised to be aware of that while planning their journeys on Sunday. Among the teams taking part will be a group of 15 firefighters from Wigston and Central fire stations, attempting a particularly special feat. The event, which has netted more than £6,000 for deserving causes in the last two years, is this year raising funds for: Fallen Fusiliers, British Heart Foundation and Action for Children. The world record they are attempting to break is the “quickest truck-pull” for a route just over a mile, set in Gloucestershire in May: 12 minutes and 52 seconds. An official and a film crew from the Guinness Book of World Records will be on hand to observe the attempt. Mr Gardener, who lives in Medbourne, thinks the record will be broken as the Hallaton Hammers team chalked up 10:24 last year – and they are back again for 2015. After the truck-pulling will be a host of free live entertainment featuring 20 music acts on The Square from 4.30pm until 9.30pm. The marquee name is 2013 X Factor finalist Nicholas McDonald with other X Factor entrants on the bill including Sam Callahan. Fans can meet Nicholas and other singers ‘back-stage’ on a tour-bus from 2-4pm with tickets costing £15. The town centre will be pedestrianised for the day. Northampton Road will be closed from the bridge near KFC; High Street up to the Abbey Street junction; and Coventry Road up to the Commons car park turn. More details are available at www.truckpullchallenge.co.uk. There is still time to enter a team. Phone Mr Gardner on 07809 635 014.